We’ve survived two weeks in France with small children without killing one another! I’d like to say that we braved the full fourteen days in a tent, but I had a major panic about three minutes before we set off for the ferry and booked the last two nights in an Air B and B in Brittany. b) the photos on the Air B and B site were taken using an estate agent’s wide-angle-lens and we were actually staying in a converted shipping container in the owner’s back garden, who was OBSESSED with making sure we closed our car door quietly as to not disturb anyone who lived within a two-mile-radius of the most boring village in the whole of France. 1. Always take more than three spare sets of clothes on the ferry for everyone. Because we get seasick. All of us. 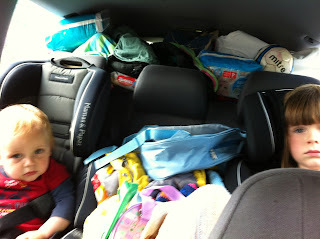 And although it’s a ball-ache to drag a massive back of clothes around the ferry, it’s more inconvenient to all be covered in puke and have nothing to change into when you’re staring down the barrel of a five-hour drive. The smell of sick doesn’t improve in the heat. 2. Don’t kid myself that I’m not going to be mainlining red wine and small bottled beers from the moment we pitch the tent. Go to the hypermarche as a matter of urgency, as the campsite shop thrives off that kind of faux self-control and charges four times as much for a bottle of Cotes de Rhone. 3. Always bring a child who’s old enough to speak along when I may be confronted with having to attempt French. And then instruct them to do it instead. It’s far more endearing for a shop assistant to have a three-year-old attempting to ask for four croissants and a bottle of UHT milk than a 36 year old woman who can’t remember anything past Tricolore 1. 4. If the children are happy then we can have a decent holiday. It might not be glamorous, or even remotely cultural hanging around a campsite all day, messing about in the swimming pool but if the kids are knackered, the chances are they’ll nod off in the pram and then we can enjoy an ENTIRE meal without having to chase one of them around the restaurant. And that means wine. A whole bottle if they’re really worn out. 5. Hanging out with your own children is ace when you don’t have an agenda. When you can get to know them, when you have full days to just bugger about, kick a ball around and have a chat with one of your daughter’s seven toys who are all called Rosie. To spend two weeks without having to say ‘HURRY UP, WE’RE GOING TO BE LATE!’ is bliss. And that now is the sign of the best holiday.